Give these mini meatloaves a try! Coat a pan w/ a little cooking spray & sautÃ© 1/2 an onion (diced), a couple minced garlic cloves, one diced red bell pepper & 2 cups chopped kale until softened. You can add pepper & whatever spices/herbs you like. In a large bowl combine cooled, sautÃ©ed veggies w/ 99% fat free ground turkey, 1 egg, lots of fresh, chopped parsley, & approximately 3/4 cup cooked quinoa. Don't over-mix! 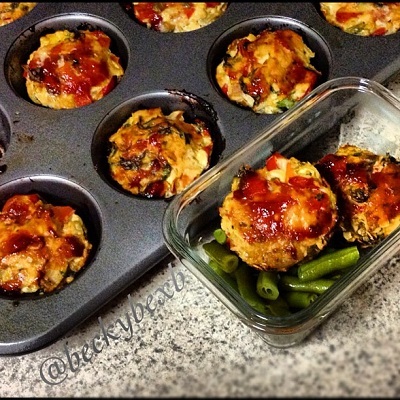 Lightly spray a muffin tin & fill w/ turkey mixture (makes 12 mini meatloaves). Top each w/ a tiny bit of ketchup & Worcestershire sauce. Bake @ 375 for a/b 40 minutes. Let cool for a few minutes & ENJOY!! *You don't HAVE to sautÃ©e veggies, but I'd recommend it!